NABLOPOMO – From Squash Hauler to Ambulance – Love my Multi-purpose Cart! Around here we do a lot of improvising (stay tuned for a post about what we are doing with a garbage can and a roofing nail… experiment currently under way in the laundry sink…). And, I also do a lot of schlepping. With my critters living in various locations up and down the road, I am constantly hauling loads of feed from one place to another. I had been improvising with one of those folding luggage carts onto which I had fastened (with bungee cords and binder twine) a sturdy plastic vegetable crate. 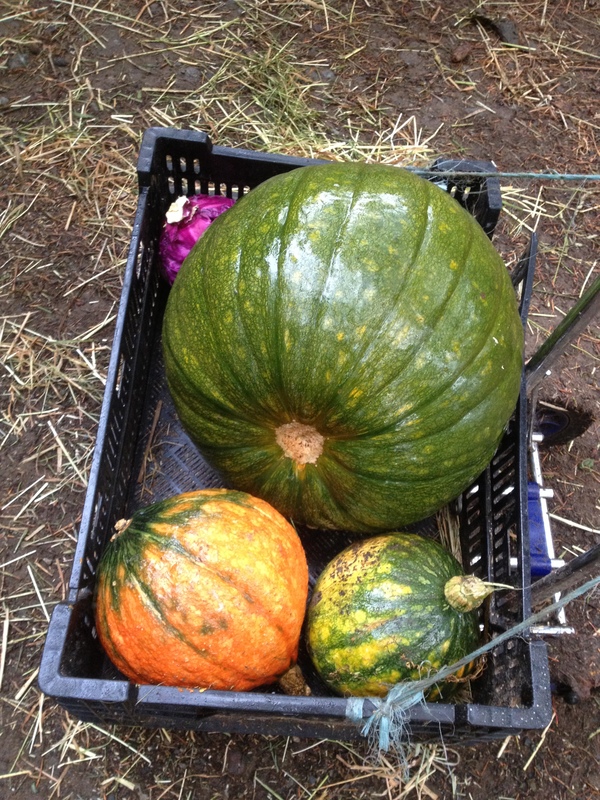 I don’t have a great photo, though here it is in use hauling pumpkins and squash from the neighbor’s place up to the pigs. The capacity was a bit limited and on uneven terrain, the whole contraption was very tippy. The handle also tended to collapse at the most inopportune of moments. Worst disaster with this unit occurred when I foolishly tied the dogs to the handle and stopped to pick up a broken bottle from the road. Mistake! The dogs spotted a squirrel and took off, scattering buckets, grain, carrots, and hay all over the road. They terrified themselves when they realized the clattering disaster was chasing after them and tried to flee into the brush. The whole dreadful incident ended with the dogs cowering in the ditch and me standing in the middle of the road with my mouth open, still holding the broken bottle. 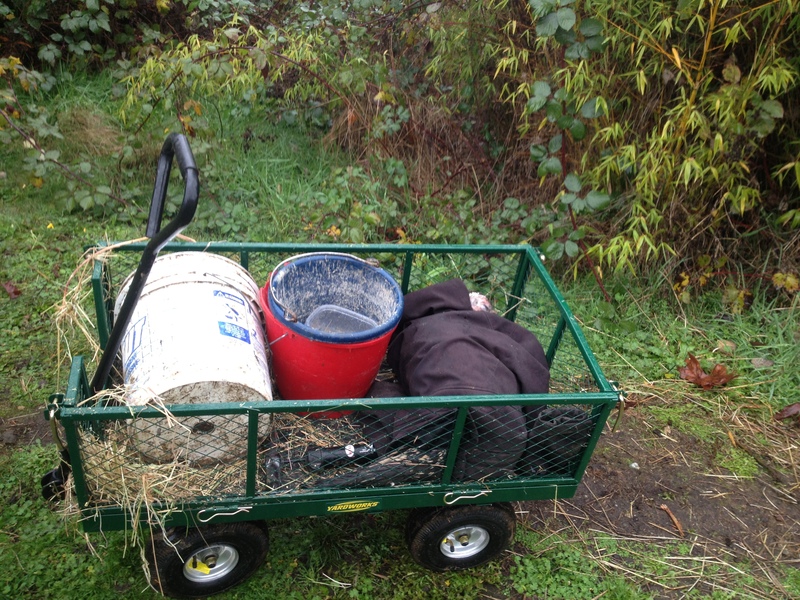 For larger loads, the wheelbarrow came in handy. 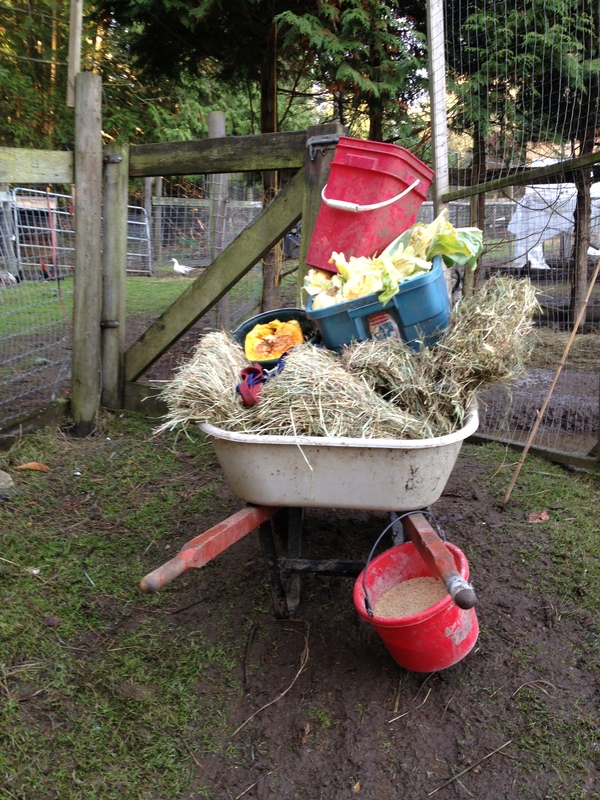 This worked ok here at our place (and, as long as I didn’t tie the dogs to it), but wasn’t so good going up the hill and along the road to where I keep the turkeys, mostly because I never did figure out a good way to deal with frolicking dogs, laden wheelbarrow, and the hill all at the same time. Recently, I procured a new schlepping device, a garden cart that is quite stable, has plenty of capacity, and can be dragged along behind the frolicking dogs. 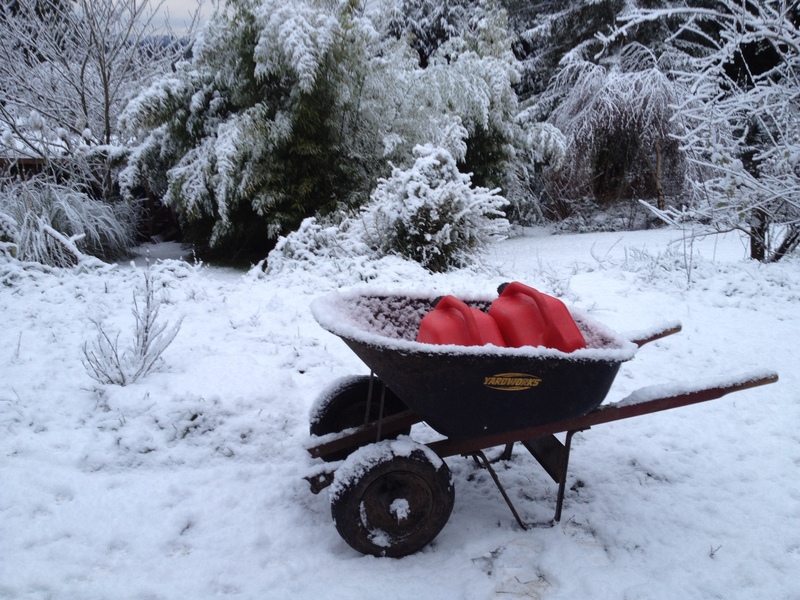 This has also proven handy during the recent cold snap for hauling water (I can get more into the cart than I can into the wheelbarrow). 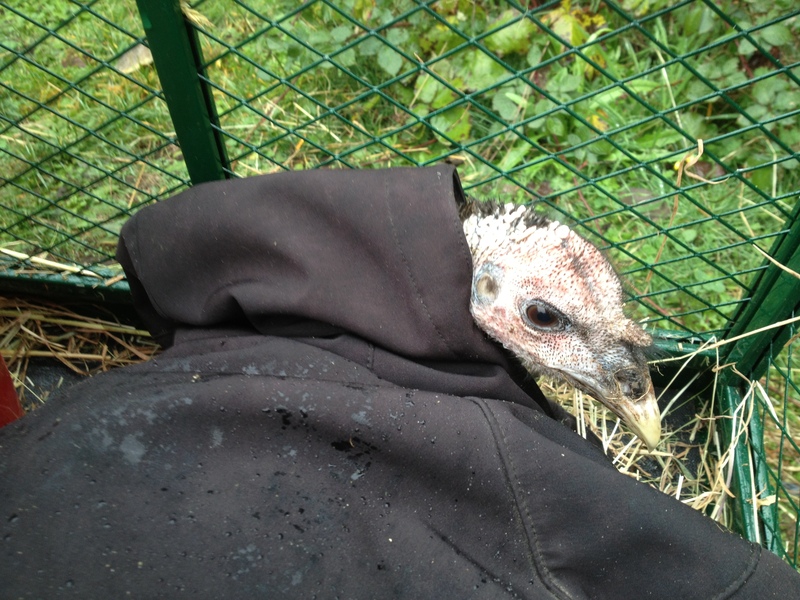 What I hadn’t anticipated was it’s usefulness as an ambulance for a turkey who was a bit under the weather. After a few days of TLC up at the turkey spa, the patient recovered fully and rejoined the flock. The other thing that I found a bit surprising was how challenging it was going to be to navigate my way through the goat pen with the cart. I know better than to attempt such a maneuver with goodies in the cart, but coming down through the goat pen with a couple of water jugs shouldn’t have been a problem. 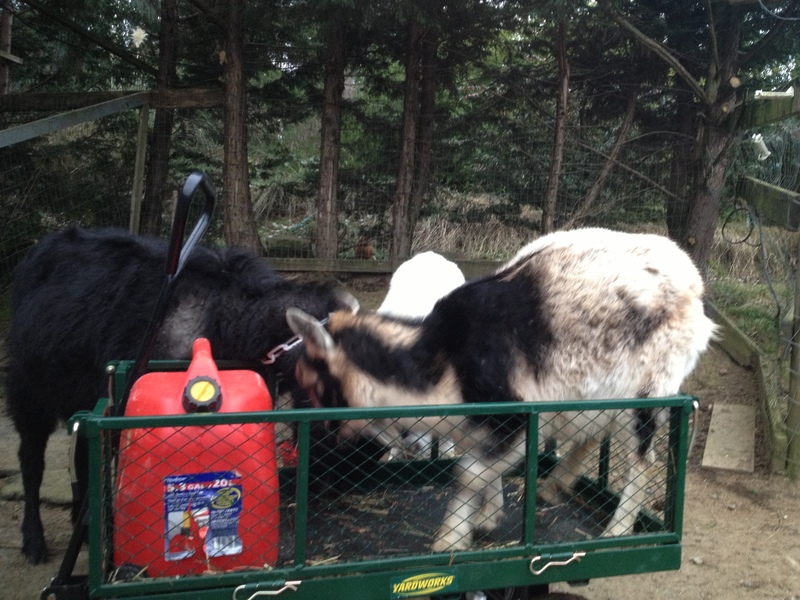 Those goats can sniff out a spilled morsel of any sort of grain or seed or fleck of carrot from fifty paces. They charge the cart and surround it, oblivious to my shouts and threats. Electra is a bit on the short side, so her solution is to jump right in, all the better to sniff around and lick up anything that might be lickable. Today’s NABLOPOMO challenge is to write the whole post in ten minutes.Perfect! I am running behind and only have a few minutes to get this done. So, how about a quick handy dandy guide to how to tell apart the sheep from the goats? Goats and sheep are similar in many ways – cloven hooves at one end and a noise that sounds a bit like ‘maaaaahhhhh.’ Though, I think goats might be a bit more nasal and whiny than their sheepy cousins. You can milk both creatures, eat both creatures, and, if you have cashmere goats as we do, you can make sweaters from their winter coats, too (though, you use the shorn fleece from the sheep and the carefully combed out and collected under-fluff from the goats). Goats are more likely to climb over their fences to escape, sheep will get down on their knees and force their way under. Goats are the ones with beards and sheep are the ones with long, floppy tails. On most farms you won’t see those long tails because they are docked when the lambs are very young, but left unaltered, they are so long they nearly reach the ground. Goat tails are short and perky and tend to stand straight up. At the nose end, the upper lips of goats are divided, whereas sheep lips are one continuous line. Goats tend to be browsers, nibbling on bushes, brambles, and bark (though they will certainly eat grass, too, particularly if there isn’t anything else). 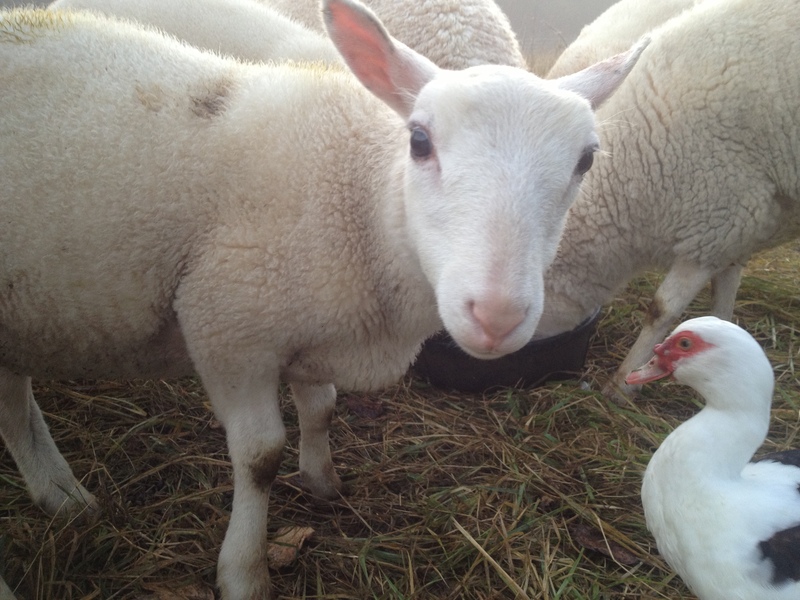 Sheep are grazers and will eat away at pasture until they reach bare ground. Rotating them onto fresh pasture before that happens gives the grass a chance to recover and helps reduce parasite loads (more on rotational grazing strategies on a day when I have more than ten minutes). Goats make fantastic brush-clearers. Their favourite treats are prickly blackberries! Goats would be the devious ones, pushy and greedy and quite fearless. Sheep tend to be more skittish, bunching together or fleeing wildly when threatened. My dogs, having been slammed into the side of the barn with a nasty head but once or twice after making faces at a goat are terrified of the caprines. The sheep, on the other hand, are terrified of the dogs. 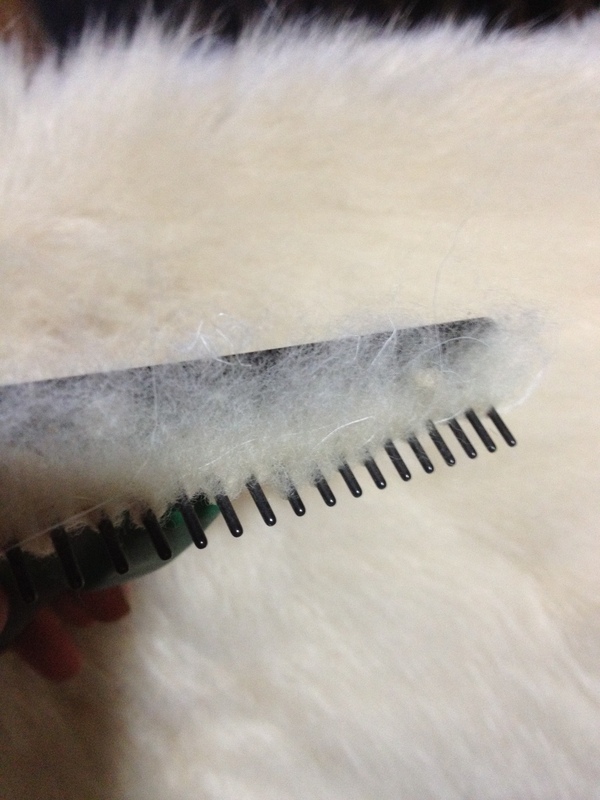 Combing out the raw cashmere is one of the more tedious and time-consuming jobs to be done in the spring. Ding! Ding! Ding! My ten minutes are up! No time to do the second part of the assignment (how do you feel about writing under such a tight deadline?). I’m breathing too hard and my fingers are quivering too much to type another word! One of the problems with livestock (at least, livestock not raised intensively in big barns) is they need a fair amount of land for grazing. This is not a problem if you happen to live on a large farm, but my farm is micro mini – not even two acres, all on a hill, part of it covered with big trees. To get around this problem I lease several fields close by and make use of every square inch of space here on the homestead. None of the fields are huge and my flocks and herds are expanding, so as a result, I’ve been tossing and turning at night trying to figure out where I can lease more land that’s not too far away. And, this needs to happen sooner than later so I can move the piglets after I’ve weaned those I haven’t already sold. Last year I had chatted with Maypenny Farm (well, not the farm – with Reay, a farmer) about possibly growing out pigs at their place, but there was a wedding planned and a need to keep the fields looking neat and tidy. I had pushed the Maypenny option out of my mind when Reay got in touch the other day and asked if I might still be interested. 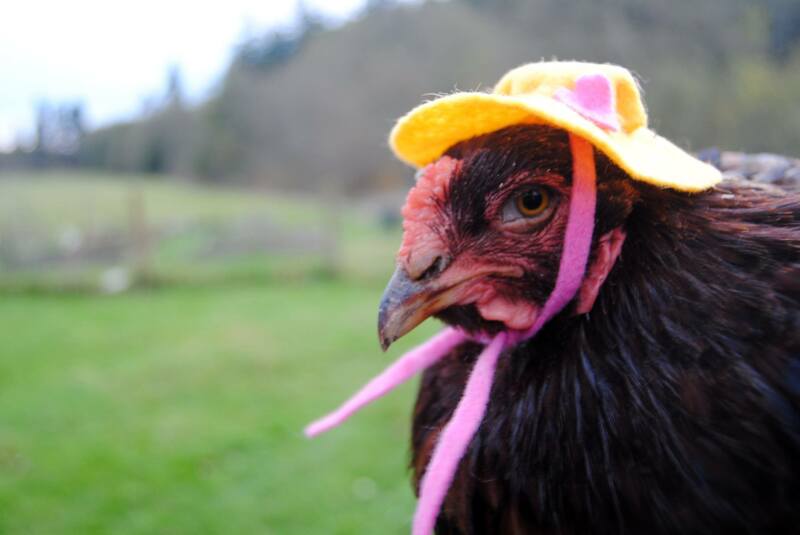 Faster than you can say ‘hen hats’ I raced over there to scope the place out to see if it might be suitable. The field up for discussion is an old hayfield being encroached upon by brambles and scrub brush along one edge and bordered on the other side by trees. Not only would the piglets have a blast in there with plenty of forage and room to roam, the plan is to reclaim the field and extend the Maypenny market garden. 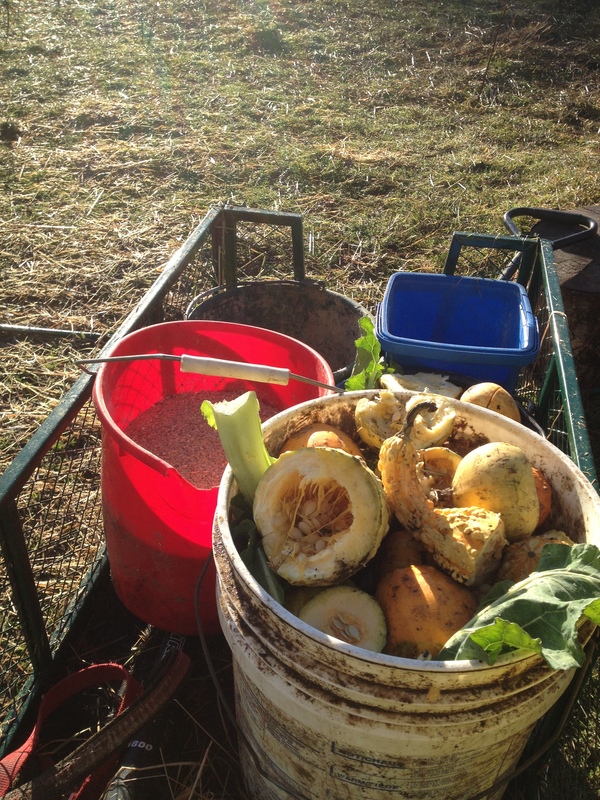 Hogs are excellent for turning over the soil, enriching it as they go. Add a couple of goats to the equation and the Maypenny farmers can just sit back and watch the livestock prepare that field ready for whatever they may wish to do with it next. The two big issues are: Water and fencing. The hogs are well trained to two-strand electric and are, therefore, relatively easy to contain. 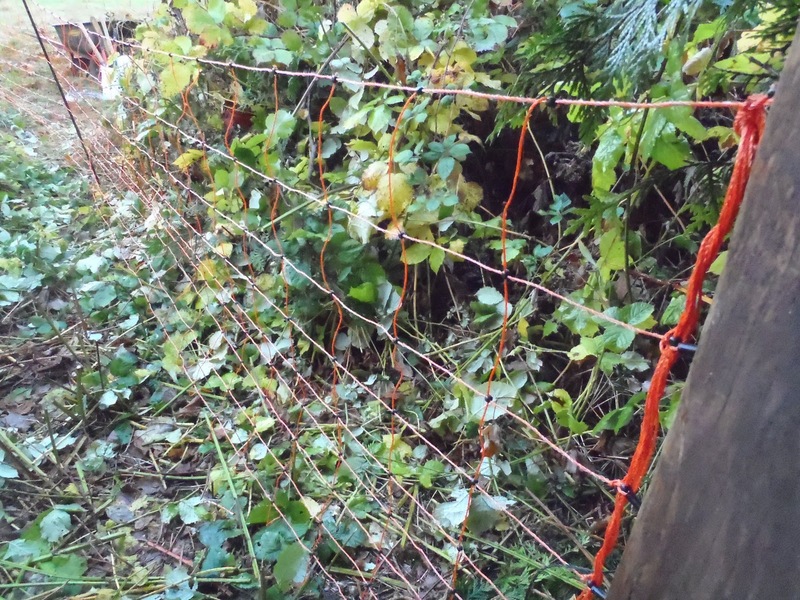 Goats are a different matter, but using the existing sheep fencing as a starting point, some repairs and new stock wire would provide a decent barrier while they are on clean-up duty. We have portable shelters that can be moved to the field without much trouble, which would keep everyone snug and dry in foul weather (unless Maypenny has hats that would fit the hogs…) When it came to discussing the water situation, the conversation proceeded in a very Canadian manner. Beavers? Seriously? On southern Vancouver Island? I had heard rumours that beavers had returned to Beaver Lake, a local landmark I had assumed was so-named because some old fur trader was homesick for a place in the wilderness where actual beavers lived. Maybe the lake actually came by its name honestly. And, perhaps the rumours about the return of the beavers are true after all! Not that Maypenny’s neighbour is happy about the return of the furry, flat-tailed loggers. They are a menace when it comes to clogging up streams and ditches and their industrious plugging up of drainage systems can cause awful problems for farmers’ fields. I’m not too worried – if the beavers decide to move back to Maypenny we’ll cope with the fallout. Mostly, standing there in the rain calculating how much fencing I’m going to need, I was delirious with joy that a good field is available, not too far away, with readily available water and lots of forage for both goats and hogs. I was so excited, in fact, I totally forgot to take any photos! By my next visit I’m sure I will be calmer and the full realization of how much work it will take to get things secure before we can move animals in will have hit me. Anybody feel like coming over for a fencing party? Maybe you’ll get to see a beaver! Posted on November 4, 2011 | Comments Off on Goats! 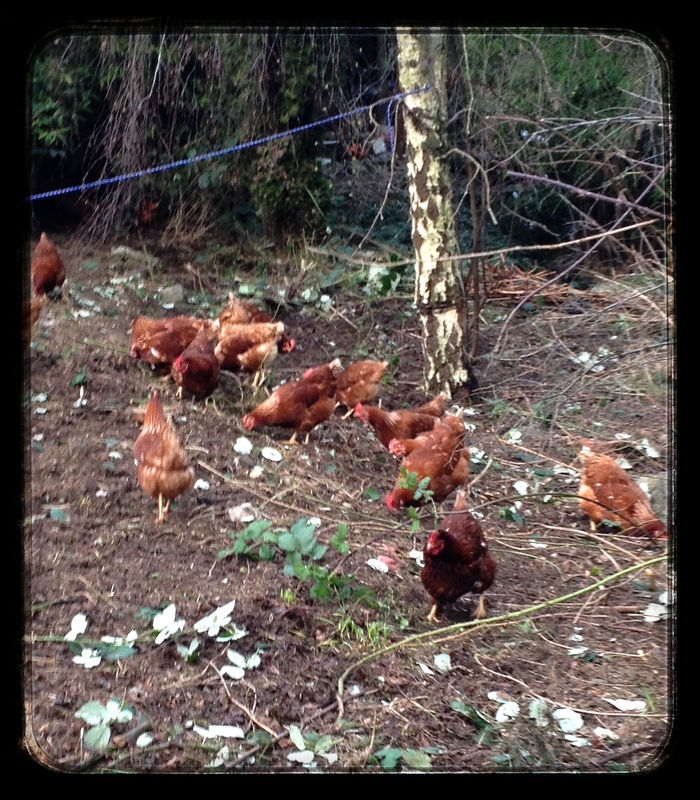 Destroyers of Brambles! Running east-west along our north property line is a spectacular stand of thorny blackberries. 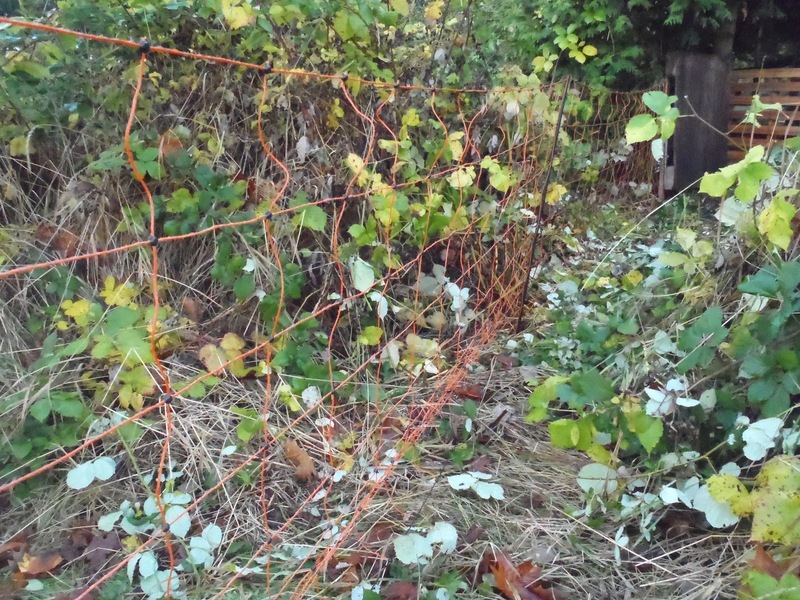 While this might be considered the neighbour’s problem, in fact, this bramble patch has made my goats very, very happy. I had read about fences like these being used by commercial goat-aided-brush-removal services in the USA (apparently there are goat herders down there who have contracts with places like national parks and highway maintenance departments) but had never seen one until one showed up at our local Buckerfield’s feed store. 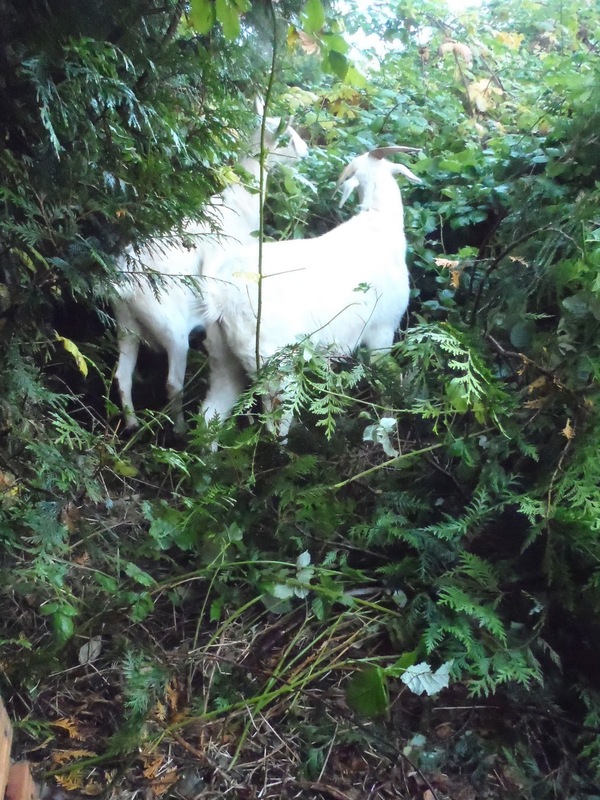 Easily installed, amazingly tangle-free, we hooked the goat barricade into my electric horse fencing and, voila – the goats were contained and happily set to work. All four goats have been gobbling away at this project. 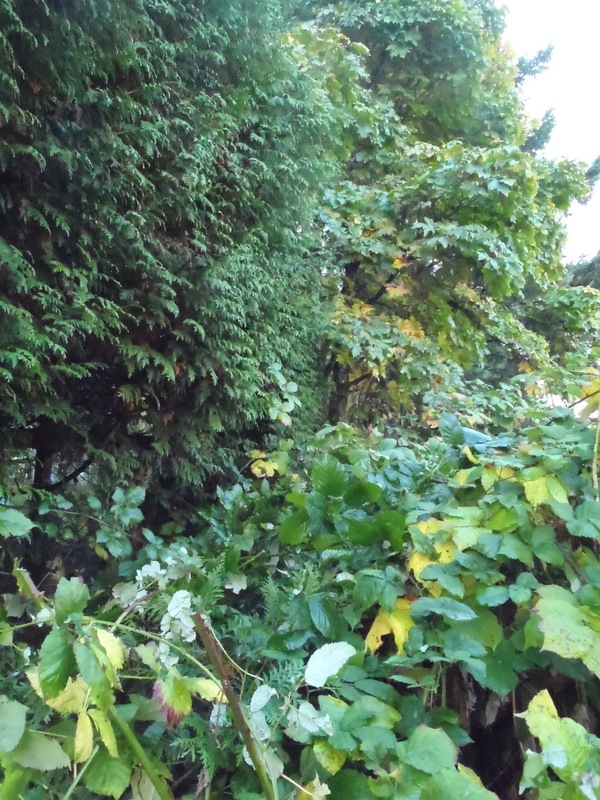 Not only are they steadily removing the pesky blackberries, they are also pruning the row of cedars along the property line and merrily fertilizing the newly revealed grass as they go. 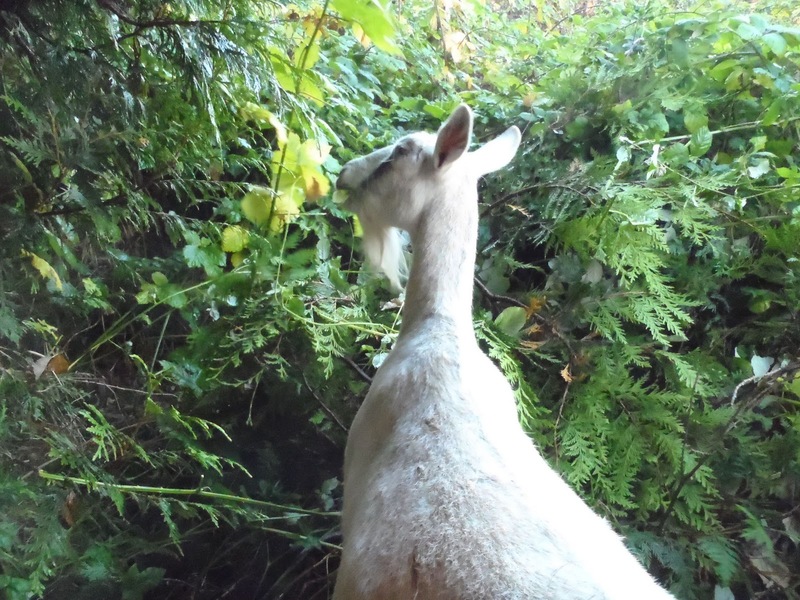 Our goats are browsers rather than grazers, so though they might have a taste of grass every now and then, their preference is to munch on the bushes, shrubs, and prickly things that had created a complete wilderness thicket. Goats are happy. Neighbours are happy. I am happy. Comments Off on Goats! 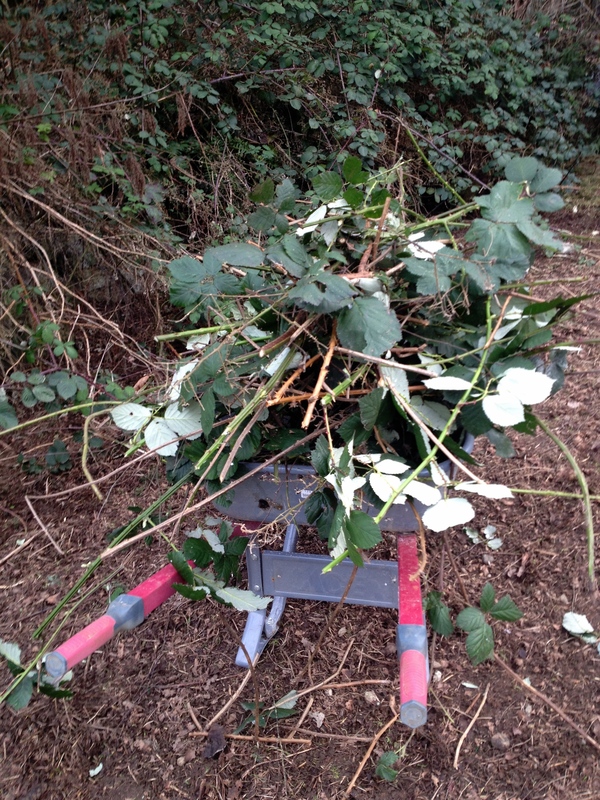 Destroyers of Brambles!